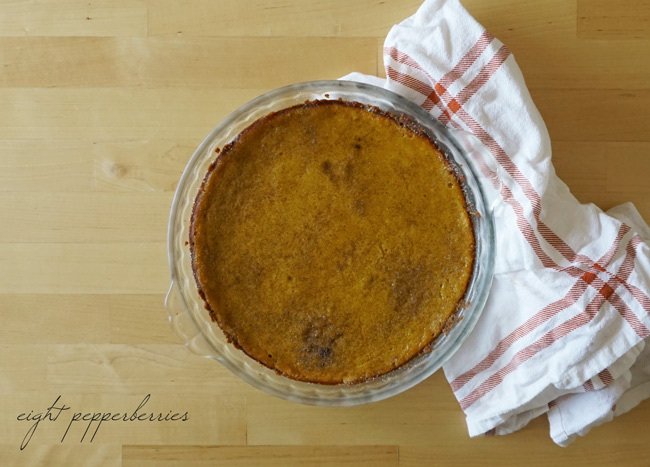 When I came up with the idea for this post I had a Julia Child fantasy of whipping up a beautiful pumpkin pie and proudly serving it to my family at Thanksgiving dinner. 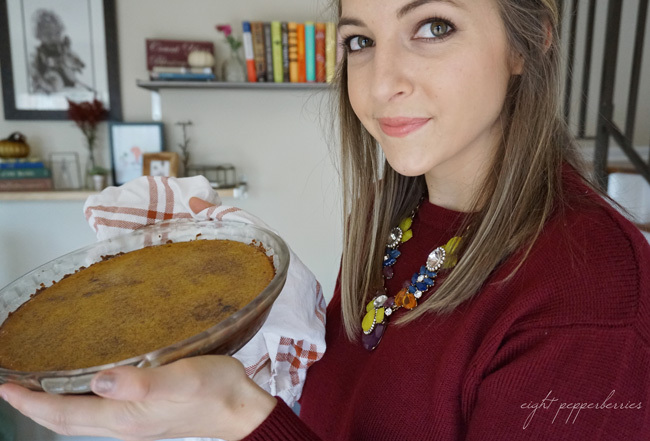 This would be my first pumpkin pie I baked “from scratch” and it had to be perfect. I scoured magazines and looked up recipes on Pinterest. Fast forward to my disaster of a kitchen and you’d find me practically wanting to pull my hair out. I know the level of my cooking abilities and baking has never been a strength for me, therefore I knew I wouldn’t be tackling the homemade pie crust right out of the gate. Although in the future I would like to learn and Mel’s Kitchen Cafe has a great step by step tutorial on making the perfect pie crust. 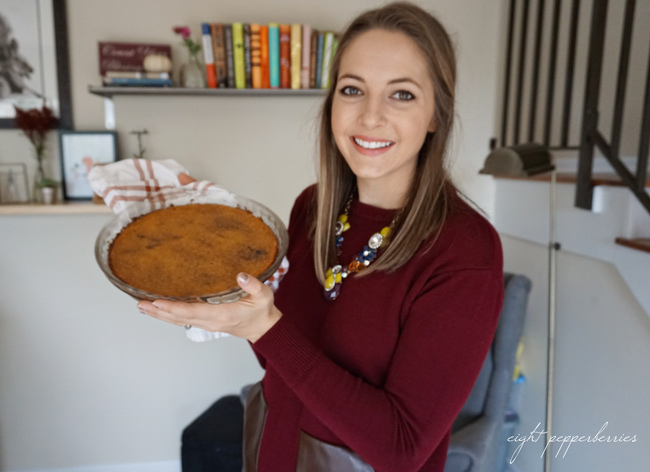 This time I decided to leave it to an expert – Betty Crocker. This is where things started to go downhill (yeah I know, I didn’t make it that far in to the whole pie baking process). 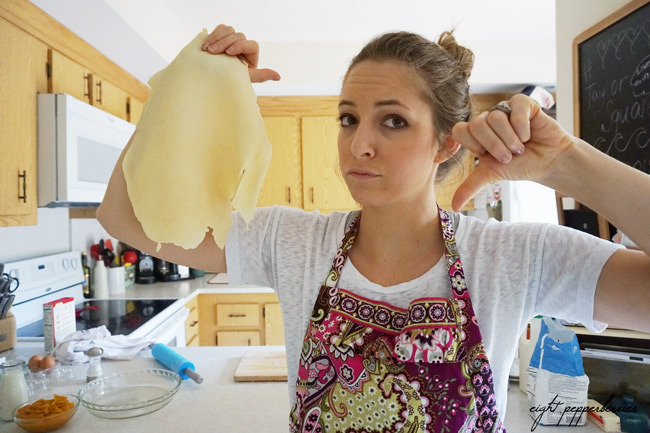 First, I tried the non-rolling method and the dough just didn’t want to budge and spread out so I hit pause and practically ran out to buy a rolling-pin, did it help? Nope. Even with putting mounds of flour down the dough refused to let go of the board I was rolling it out on and rolled out in an odd shape that didn’t even come close to filling the pie pan. I had a backup plan for this turn in events and had bought a graham cracker crust while I was out and about. Sadly, while unpacking the pie crust it crumbled in to a bazillion pieces! Ok, so maybe not a bazillion pieces, but it definitely wasn’t useable. Pinterest came to the rescue and I found a recipe for a graham cracker crust and figured I could at least salvage the broken crust. I quickly threw butter in the microwave to melt and started crushing the graham cracker pieces in a bowl. Suddenly, POP! The butter burst in the microwave. Tears instantly sprang to my eyes, but as I pulled the greasy butter bowl out of the microwave I could only laugh. 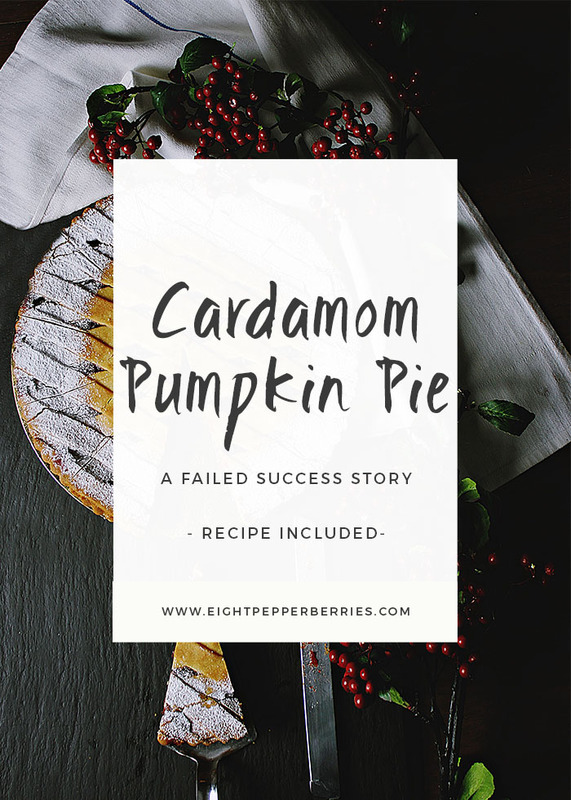 Even though my dreams of the perfect holiday pie were quickly being swept away I decided to press on and while my pie may not be a winner in the looks department it still had a shot at tasting yummy. I pieced the crust back together and placed it in the oven to reset. 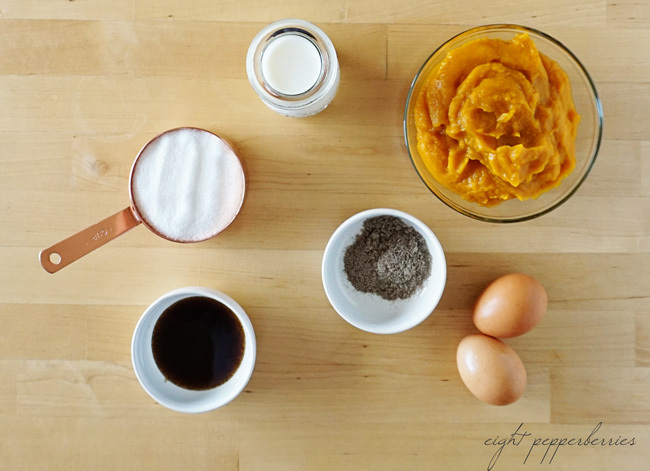 Now I had time to focus on the filling, the recipe called for canned pumpkin, but you could definitely make your own pumpkin puree – I recommend trying this pumpkin purree recipe from Six Figures Under if you’re up for the adventure. While staring at it for a few minutes I decided to hold off on that highly anticipated first bite (a girl can only take so much big thumbs down in a day). Finally, when I got up enough nerve to have a slice, half of the crust stuck to the pan (go figure) and it actually tasted okay. My pie tasted okay! Now don’t get me wrong I’m not entering it in to a pie baking contest any time soon, but this small success meant so much. And I figured that’s life right? Sometimes – hell most of the time – life doesn’t go according to plan, but we have to move forward. I find myself getting caught up in the fantasy of what I think my life should be that sometimes I forget that it’s the journey that makes life memorable. We wouldn’t have those funny stories to tell if everything went perfectly. Did this project turn out as I had hoped? Absolutely not, but I’d do it all over again in a heart beat. There are times in life that the process is much more important than the end result. So friends, don’t be afraid of trying and failing. It might take me baking 100 pies before getting it right, but mark my words one day I will make a homemade pie. Until then, I proudly introduce to you my failure of a success pumpkin pie. Have a sweet day friends! Thank you for your words of encouragement and advice! I will definitely take them in to consideration next time I tackle a baking project. And I most definitely conquered the weird amoeba-shape, ha!